The Cow Wall® was LIVE on the walls of New Seasons Market in Vancouver (Washington, USA) for the month of December 2018 and January 2019. Yay! What is The Cow Wall®? 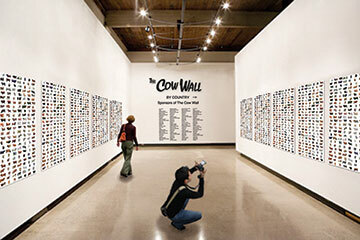 The Cow Wall® is a daily on-going project. Cattle breeds are thoroughly researched and then made into Cow Wall images. Where will The Cow Wall® go? Schools, agricultural centers, state fairs, your street, your parking lot – anywhere, basically. 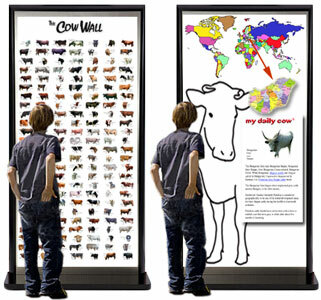 The two-sided screen: cattle breeds in alphabetical order on one side; cattle breeds by country on the other side; one end panel listing sponsors facing both sides. Cattle breeds would be displayed alphabetically in one area and then (if room) displayed by country in another area – also with a listing of sponsors. Why not have a touchscreen display for science museums, children's museums and agricultural centers? Displays that you could scroll and touch to select a breed, then see a map of where the breed is from, some history and what that breed’s average height is as compared to you – and that’s just for starters. FIRST - It takes money to print posters and panels. You can buy the My Daily Cow® App (go here for a full description of the app). THIRD - If you think you have a better looking example of a cattle breed that is already on The Cow Wall® – send that too. - What breed you think it is (if you have any idea). - Where on this planet you took the picture (very important) – name a city close by or some other geographic reference point or the GPS coordinates. FINALLY - Spread the word! The Cow Wall® is coming.